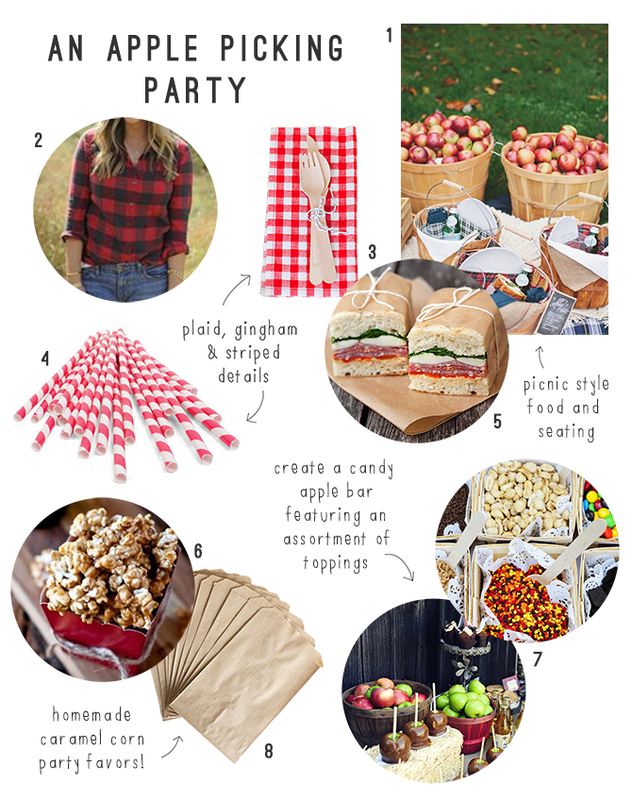 An Apple Picking Party | Evermore Paper Co. I'm on a huge apple kick right now (who isn't?) and can't seem to get enough of them. Already, I've baked two apple-inspired treats, here and here, and I made a promise to myself that I would attempt to bake my first pie this season. All this talk of apples has got me thinking about how fun it would be to throw an apple picking affair following a day at the orchard. I'm envisioning apple cider hot toddies and a make-you-own caramel apple bar. Also, plaid picnic blankets and striped straws would help round out the decor and you could expect to find me wearing my favorite flannel shirt. You could even ask guests to bring their favorite apple dish and stage a little bake-off. Yummy!